This home will consider a pet. 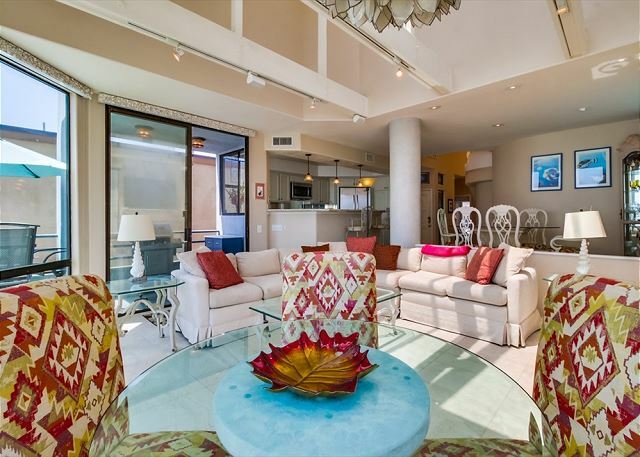 This dual-level bay front condo occupies almost the entire second and third floor, with 2,000 square feet of living space. 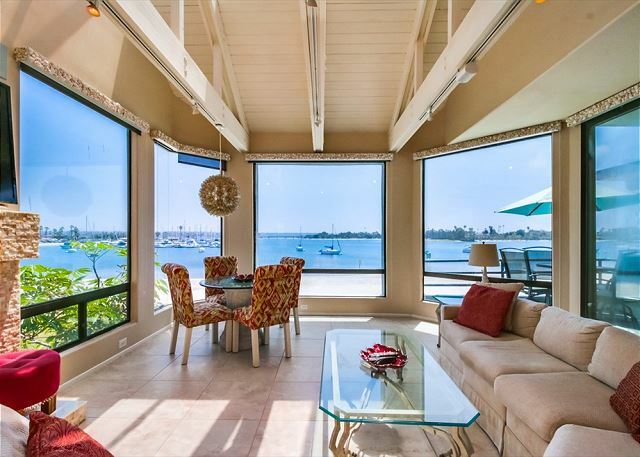 The second floor features a large living room with even larger windows facing Mission Bay. 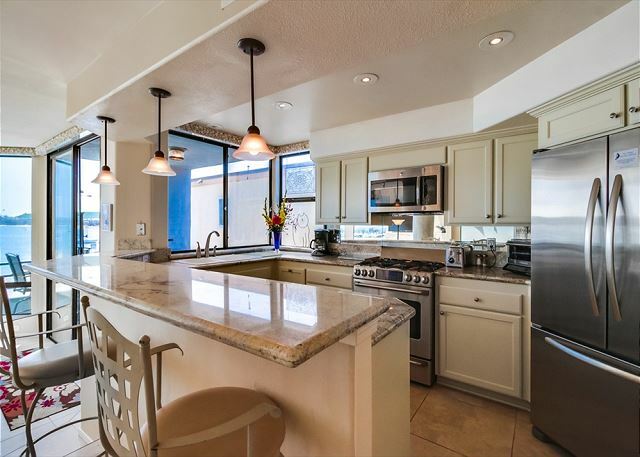 The floor plan is very open with the kitchen and dining area elevated above the living room. 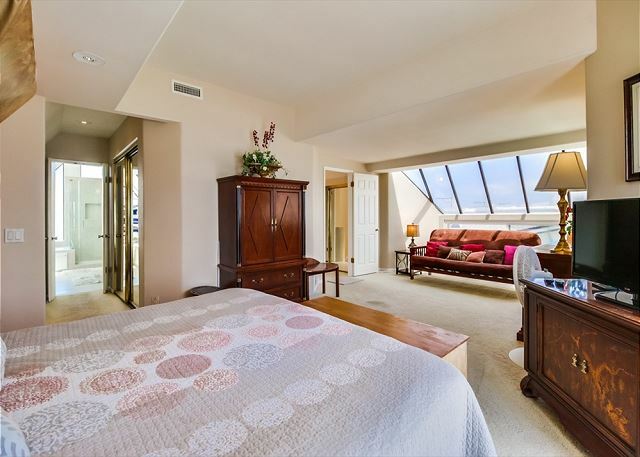 The feeling of spaciousness is further accentuated by the main living room that opens to an awe-inspiring glass enclosed ceiling on the third floor. 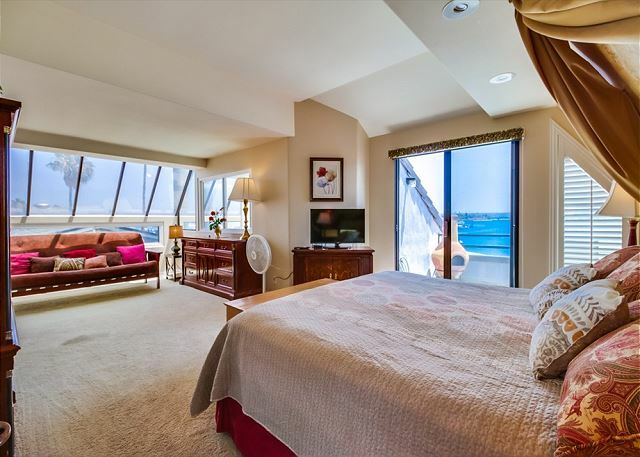 On the penthouse level, a huge master bedroom suite provides stunning views of the bay. The master bedroom has a King bed and a Full sized futon, the second bedroom has a Queen, and the third bedroom / office has a Full size futon. 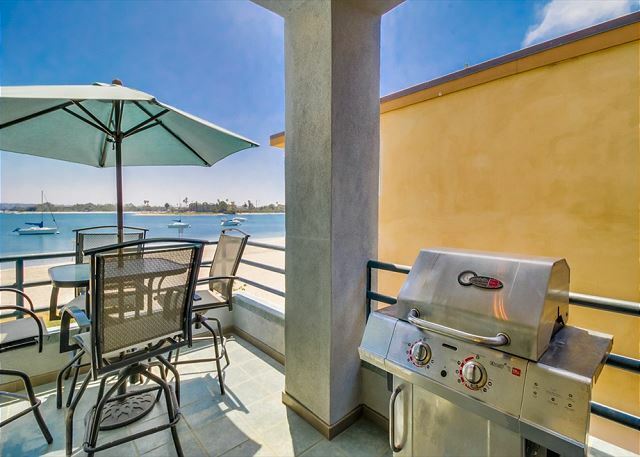 There is a private second floor balcony off the living room equipped with a BBQ grill. Please note, the ground floor patio is designated for the other unit within this building and is unavailable for use with this rental. 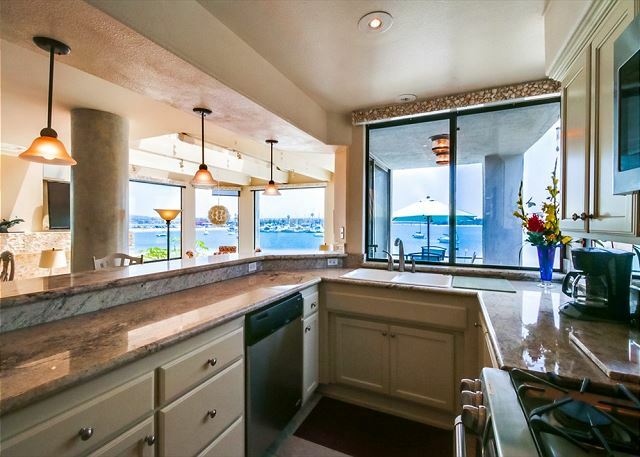 This property has an air conditioner however, it is rarely needed with the breeze coming off the bay. There are beach chairs, boogie boards, skim boards, beach umbrellas and beach towels available for guest usage. PARKING is limited throughout the Mission Bay area. 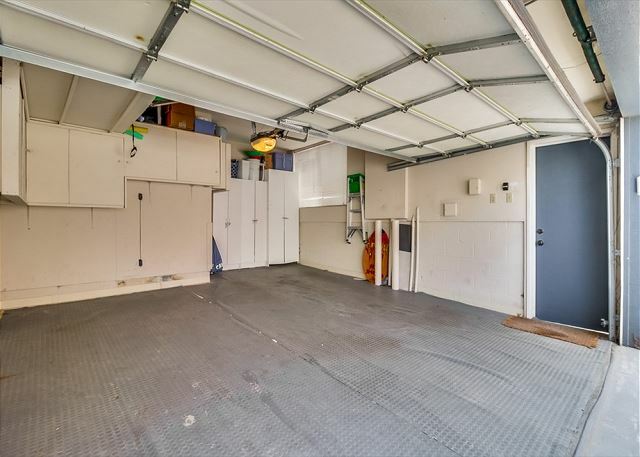 This home includes a two car garage, the dimensions of the space is approximately 6'4" H x 14'7" W x 16' L. Please be sure the vehicle you bring will fit in the designated area. The larger side of the garage allows for a medium-sized SUV. The smaller side of the garage allows for a compact car. If you have any questions regarding parking please contact us. The Mission Beach and Mission Bay vacation communities are centrally located in San Diego for easy access to San Diego County's most popular attractions including Sea World, the World Famous San Diego Zoo, Balboa Park, Seaport Village, La Jolla, Ocean Beach, Downtown San Diego, Coronado, Del Mar and much more. Thank you for such a wonderful review. We hope you will consider us the next time you visit San Diego. Thank you for the nice review. We hope you look us up the next time you visit San Diego. The house was very comfortable and accommodated our whole group (3 adults and 3 children). 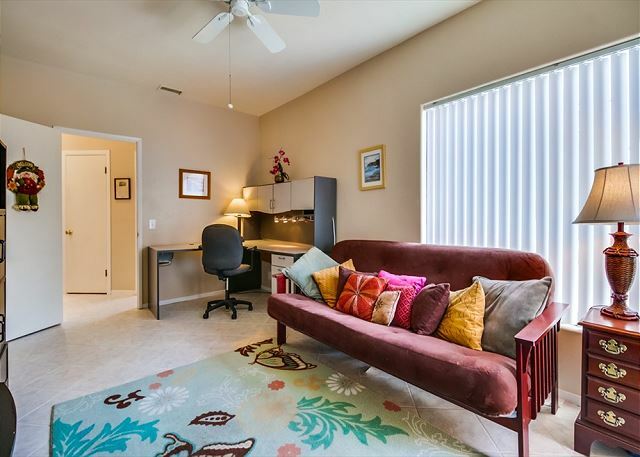 However, I would not recommend it for more than two couples since one of the "bedrooms" has only a futon in it so not the most comfortable and the second futon is actually in the master bedroom. Okay if you are a couple with small kids as they can sleep on the futons. Otherwise, the home was clean, well equipped and very comfortable. 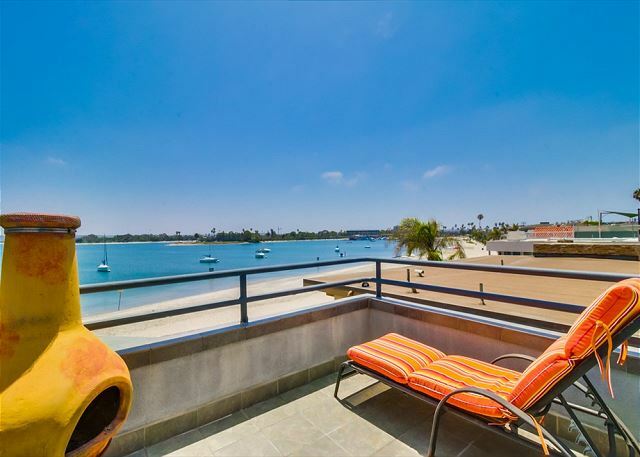 The view from the living room area is fantastic and the beach is a short walk away. We had a wonderful week in this unit. Great location. Great view. The unit had everything we needed. It was a plus that there is A/C. Being on the bay, it can be pretty still and it was useful on warm days/nights. My only comment about cleanliness was the floors. Master bedroom carpets need to be cleaned and they weren’t vacuumed. Tile floors need to be mopped between visitors. It was nice that garage had sand toys, umbrellas, beach chairs, etc. from previous guests. All in all, we would stay there again without hesitation. Another great place on the bayside! We stay in Mission beach quite often and are always trying new places. This one was really nice. The kitchen was one the best equipped we have ever had. lots of room to spread out and great views from everywhere. the place was clean and well-maintained. Wonderful location!!! We would definitely stay here again. Everything went very smooth. We arrived late at night and had no issues. The codes for the garage and door worked. We parked our car in the 2 car garage, which is a huge plus. There is very little parking on Mission Beech. The condo had no issues so I had no communication with the management company. The condo was very spacious. Sitting on one of the balconies watching the sunrise while the kids slept in was worth the price. The only star I took away was that the place could use a good spring cleaning like shampooing carpets. But I would recommend this to anyone. My family and I stole time away from our family farm and couldn't find a more relaxing and comfortable place to stow away! 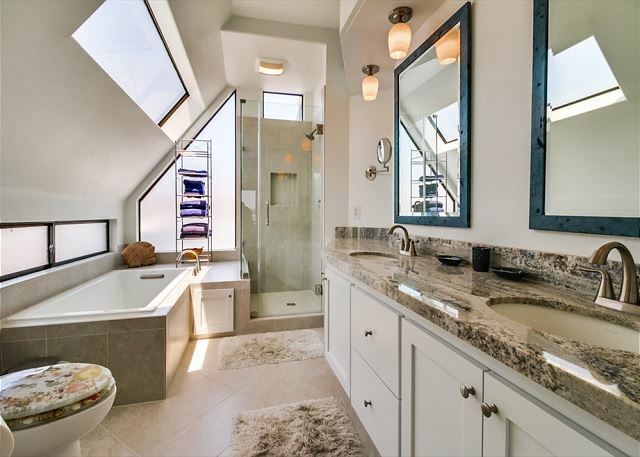 This house offered all the conveniences of home with all the amenities and the views were just icing on the cake. We enjoyed all there was to offer in walking distance from the condo! 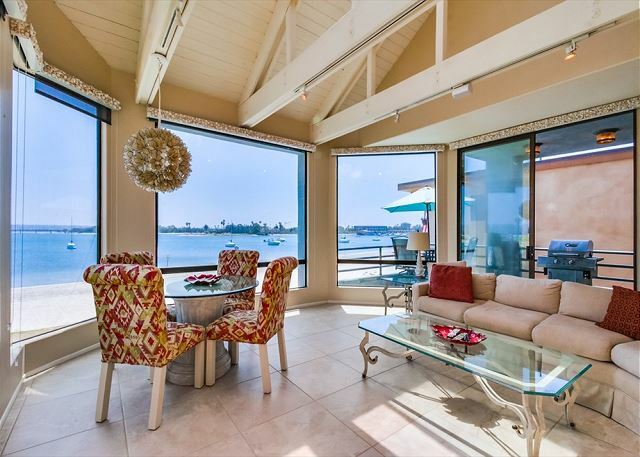 Absolutely lovely beach house overlooking San Diego bay. Lots of space. Funky/quirky layout - tons of natural light. Only complaints - sliding door is nearly impossible to open. No place to leave bags after strict 10am checkout policy. Also, upstairs balcony was under construction - was looking forward to that. Otherwise, lovely, clean, safe. Great location for riding bikes and hitting the beach. We had a great time. The location was good and easy to get in and out of. It would be nice if there was an info sheet for where to find items in the house. A larger garage and some beach items would be helpful. We had an issue with the master bath shower flow and outlets when we arrived, but one call to the mgmt company and all was fixed very quickly. This home is surprisingly private for having so many windows. The location and view windows from the living area made this a fantastic stay for us. We used the boardwalk daily and enjoyed how low-key it is compared to the beach side. Absolutely fantastic vacation - thanks in part to this lovely condo. We had a great time hanging out in the house and exploring the wonderful surroundings. Very Nice. Lovely view. Well furnished. Needs a remote garage door opener and shower in master bedroom fixed. What a great location and a beautiful home away from home. Our family had a wonderful time in this beautiful bayside home. The place was really nice and well stocked. Only issue we ran into was the garage ... key pad broke so we couldn't get our car in, then bettery on the remote went dead so we couldn't get our car out. I was very surprise that the maintenance guy didn't have a key for the garage door. We stayed from February 10 to 16th. When we arrived the unit below us had a gas leak which forced us out for 2 days. Overall the unit was nice. 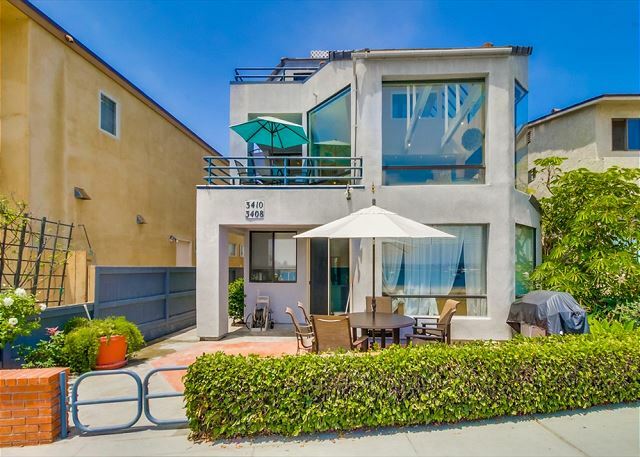 Location was good and quiet but if you wanted more just a block away from the ocean walk and more action. For a family it was nice to be in a quiet area. It was not as clean as we would have liked. There was five of us that came to San Diego to watch a Monday night football game. The home was as beautiful as the photos. Everything we needed was provided. 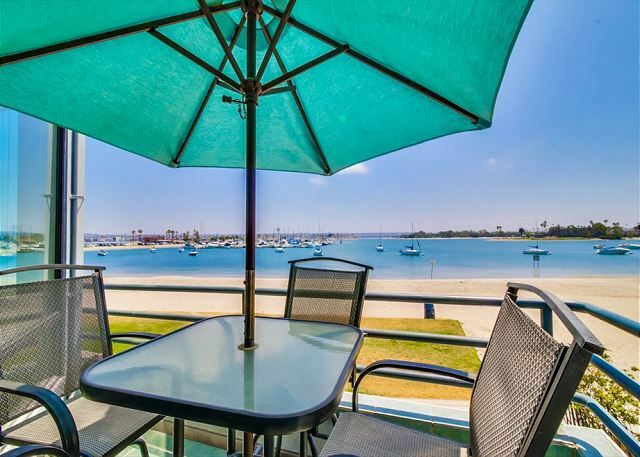 The location was perfect, facing the bay, coffee in the morning, drinks at night on the deck overlooking the water. We had a fantastic experience at a beautiful location. I would strongly recommend this vacation home to any family or group of friends. great location in a great location! Can't beat being on the Bay-but there were maintenance issues, things have been neglected.The washing machine didn't work, and our phone calls got nowhere, had to use the laundromat.the patio table is falling apart, and the seat one of the chairs was ripped. There are loose screws in the door jambs, the master bedroom carpet looks(maybe it is)especially dirty, the shower in the master bath was too small for my tall husband, the faucet in the shower downstairs has no stop. the third bedroom is not actually a bedroom, its a room with a desk, but the futon was comfortable enough for a 14 yo.Everything else seemed nice and clean. Linens could be newer. I mean, for the price of this rental, get some new stuff!! Homegoods is not far away. We had an awesome time, this is our 2nd year in the same place. 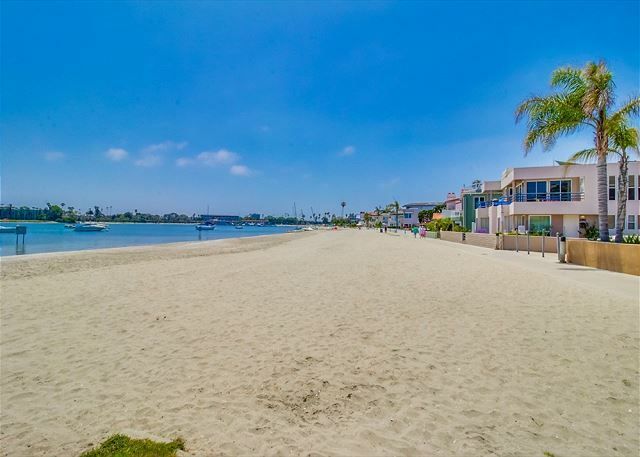 The location, garage, access to beach, grass front area makes this an amazing fun incredible place. The fridge went out but that happens and they replaced it with a new one right away. This place was PERFECT!! Beautiful view, very clean and great location. We had a great time just taking in the view. The launching ramp was to the left of us about a thousand feet so that was great for us as we launched our vessels. Resaurant left and right. Plenty of things for kids to do. We had a garage loaded with beach equipment along with all cooking and eating utensils in the home. The staff and management company were wonderful, very attentive and caring we were lucky to deal with Michelle kile who was wonderful. Overall it was a great experience. We would recommend this place with out a doubt. One of the nicest aspects of this property is that its living room area has vaulted ceilings with giant bay room windows. 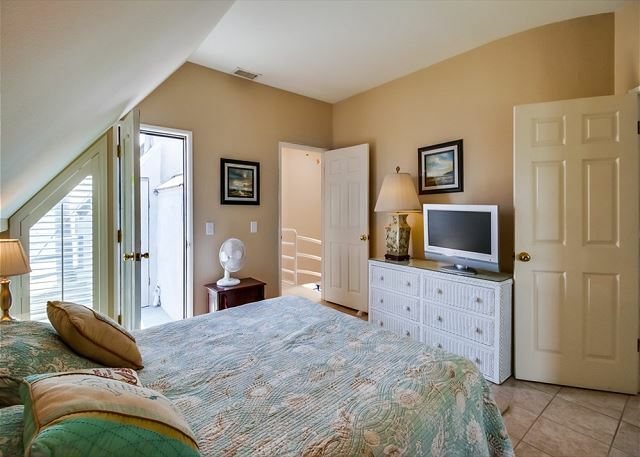 Its location makes you feel as though you are on the bay while enjoying the comfort of the rental. It especially comes convenient at night when the sea world fireworks go off. The rental is fully stocked with all the supplies you need (gas barbecue, easy to use fire place, boogie boards, televisions, internet, etc). My family and I had a fantastic time!